Foreign exchange rates in each country are affected by demand and demand. We in Iraq do not go out of this economic process. Such behavior is an important fact that raises a very important issue for the nature of external and internal factors, which contribute to a large extent to the actual need to fall within the framework of national public requirements of domestic payments. 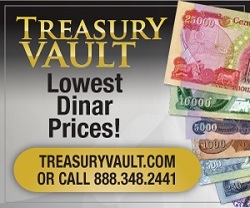 It should be recalled that a group of experts and specialists in financial and economic affairs have been encouraged to process the revaluation of the Iraqi dinar against the value of the dollar and other foreign currencies depending on the frequent circulation in the purchase of ration items and not limited to international purchases that rely on foreign currency from external sources, Is a practical way out of some of the dilemmas suffered by the Iraqi national economy related to the large foreign exchange of the proceeds of Iraqi oil sold in the world crude oil markets. Iraq, which has risen and overcome many of the challenges and difficulties on the path of emancipation is today in a better way than to open the way for reforms and economic treatments studied that would rid the country of many constraints and self-reliance and the activation of benefits based on the possibilities and capabilities National.